A selection of drawings from life of and by Women artists of the Clarence Valley is on at the ILUKA Emporium for the month of August. Relax in our comfy chair , peruse Art books featuring the work of world renown artists. Exhibiting artists will be available to sketch you if you choose . A collection of CYANOTYPE prints by Krissi Mayo, Ruth Boyd, and Annie Roberts. Cyanotype is a photographic printing process that produces a Cyan-(blue ) print , when an object or negative is placed on a light reactive surface. The image develops in UV light. Engineers used the process well into the 20th century as a simple and low cost process to produce copies of drawings. with live music, …. Dom Ferry and the Laneways open!!!!! Fiona Nicholls …artist, teacher, traveller and waterwoman. The collection of recent work is an expression of life centred around the OCEAN! The coastal experience of my Australian home on the North Coast of NSW and living on a catamaran in the South Pacific Islands . The THEME that flows through all pieces is WATER CLARITY …….the importance of caring for the reef systems and maintaining clean ocean environments. For me as an ‘artist’ the natural environment is a source ofgreat inspiration and spiritual connection. WATER as subject especially so! On the surface , in the wave zone; just below where both worlds exist; and underneath in the blue zone , where reef and life are another world! Please come and………………enjoy my world. Five members of the Iluka Emporium will exhibit their work for the month of November. Visit the Emporium to enjoy this eclectic mix. Small gouache sketches from around ILUKA by Linda Frylink Anderson, a collection of assemblages from Mickey Hatch, images photographed by Tony Belton from favourite ILUKA venues, superbly stitched creations and collages by Michelle Philip, ( geckos new tail) and our newest member Lee Ann Halley presents a collection of beautiful basketry. We pride ourselves on variety, locally hand made and quality. Visit the Emporium during November to enjoy this collection. I intend, through my work, to paint my interpretation of energy of the physical, meta-physical and spiritual realms and their ongoing relationships, reflections and restrictions in the world today. This to me is energy and this energy, I feel, flows through the use of colours in various shades, shapes and lines and also in dots, big and small, all interacting to form a story to reflect my current understanding of the world around me. With the visionary vehicle I hope to capture and express the meaning of life and death, Hopefully this will draw people together in discussion as to what really is my intention behind the work. With this I would like to leave the viewer with a sense of mystery. It is said the eye of the beholder does or does not find beauty and therefore I hope my work reflects the positive or at least evokes a source of discussion to allow for such growth in an individual or the greater collective of the viewers. In a way I wish to capture, express and explore in my art, something which is like the internal fusion of the sun. For me, it is the light which floods and nurtures and guides all beings, yet is still steeped in mystery. Through the mystery we yearn to find what could be interpreted as our God or whatever consciousness we seek as evidence of a divine,supreme being. Beautiful art taps into the physical,mental and spiritual relationships which is exactly what Alex Grey’s work is to me and countless others here and abroad. This is why Alex describes his work as transcendental art. Alex’s quest in art is to make integrative art that visually unites the mind, body and spirit. This, he claims, helps to heal the disconnection between the individual and the natural world we live upon and within. Our 17 strong dynamic group of artists come from diverse backgrounds and areas of interest. However, we all love creating artworks using a variety of mediums and styles.Our membership ranges from novices to recognised artists who regularly sell their work. The more experienced artists offer advice and encouragement to beginners and regular tutorials by professional art teachers has helped our abilities grow considerably over the past 7 years. Our group formed in January 2010, initially meeting in the homes of foundation members until, our group leader ,Margaret Thomas assisted by Julie Hammond, arranged with Parks and Wildlife to use Woody Head Hall as our ‘home’ venue. It is here we gather on Tuesday afternoons to create our art. This is a wonderful venue where we can listen to the sea and wind in the trees and occasional birdsong. Young campers often come to check out our work and some bring their own supplies and join us for the afternoon. We are not sure if it is our company or the great afternoon treats provided by the cooks in our group.! We had been meeting for approximately 3 years when our previous Librarian , Wendy Rose, suggested we hold an exhibition in the Iluka Library. With great excitement we pooled our artworks and curated very successful week long exhibition-the first of our now popular biennial exhibitions. We have also held 2 successful exhibitions in the RSL Hall in conjunction with Museum displays. More experienced members of our group contribute to other exhibitions in the district; Janet Hauser being the most recent. We do hope visitors to the Emporium enjoy our work and can perhaps join us for the celebratory Opening on Saturday2nd September between 1 and 3 pm. This month we have a mother and daughter team exhibiting. Michelle Philip and her daughter Luna. Keen to encourage young artists Iluka Emporium were thrilled to hear Luna wanted to exhibit. She has been out and about over the last few months working ‘en plein air’ gathering subject matter and inspiration for her body of work. One of these painted onsite at Sandon River. Luna says she enjoys making Art as it is something she can do by herself. She says she loves using her imagination and enjoys using pattern. Luna , who turned 10 recently, has used a range of media to create her artworks. Water colour, acrylic paint and oil pastels. She admits she enjoys using oil pastel most as it needs no drying time and its smoothness allows easy blending of colour. Michelle studied Visual Art and majored in Textile Design. She designs and makes hats and unique fashion wear under the label Geckos New Tail, which features in Iluka Emporium. There will be an Opening event on FRIDAY 11TH AUGUST at 4PM at ILUKA EMPORIUM. 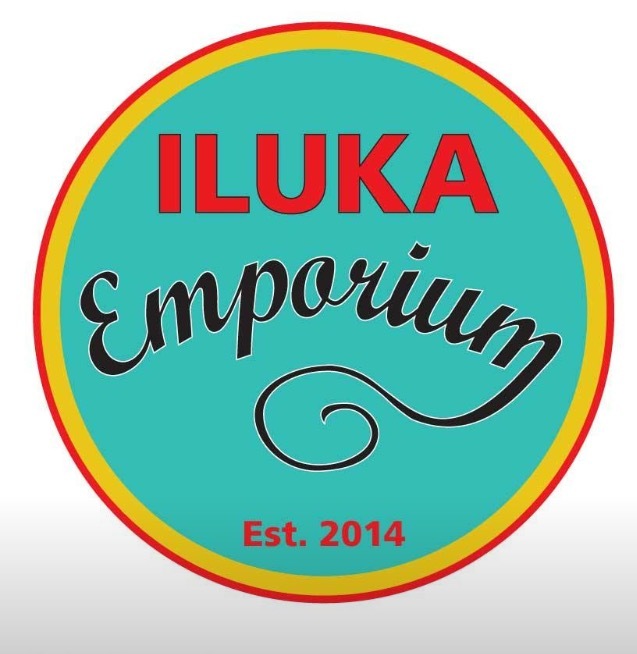 Iluka Emporium is located at 61 Charles St, Iluka 2466. We are open Thursday to Monday 10am – 4pm. We have a great monthly art space available to local artists and community groups, email ilukaemporium@gmail.com if you are interested in booking a spot for future artist of the month. Iluka Emporium warmly welcomed local artist Julie McKenzie as artist of the monthly for July. Julie’s exhibition features mixed media small paintings and prints on paper. Her works are bold, bright and capture landscapes from around the Clarence and beyond often featuring our native birdlife whilst also venturing into imagined landscapes. Julie lives and works in Maclean, where she owns and operates Kingstudio an artist’s run enterprise. The studio also features a regular exhibition program that provides visitors with the opportunity to view and purchase works in a wide range of media, including painting, printmaking, digital media, stunning pottery and other hand crafted objects. Since moving to Maclean Julie’s paintings are centered on the environment around the Clarence River. Focusing on the fragility of untouched forests and the onslaught of human development. Julies work is usually quite large, you may have spotted her Paper Bark paintings? One work currently is on a bill board on the other side of Grafton.